It’s a simple idea with endless possibilities – place storage shelves close together to save space and easily move them to create an access aisle. 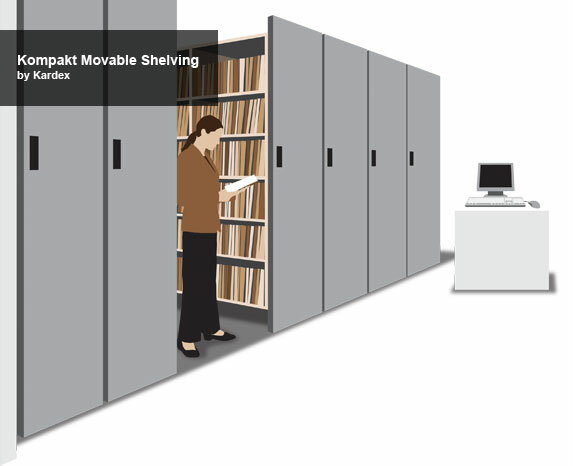 This versatile system can accommodate existing shelving or be customized with specialized shelves, racks or bins. Kompakt system has lengths and heights to fit any space. The units move easily with automatic, mechanically assisted or manual controls. It's just that simple. The possibilities are virtually endless with the Kompakt system. Carraige lengths and hieghts are available in any size increment to fit most storage needs and adapt for irregular room sizes. Carraige Size Carriage sizes can go up to 60 ft. long and are manufactured to fit all standard size shelving usually with a maximum of 36 in. deep. Carraige Payload All carriages are made to hold 1000 lbs. per linear foot.